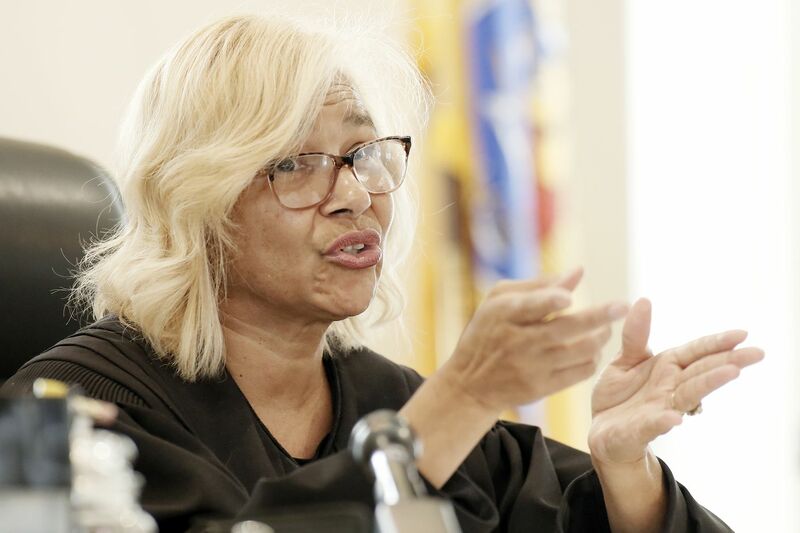 Burlington County Superior Court Presiding Chancery Judge Paula T. Dow during a hearing in Mt. Holly, NJ on Aug. 30, 2018. Attorneys for Johnny Bobbitt, a homeless Philadelphia man, appeared in court on Thursday for the first court hearing after Bobbitt filed an injunction against a Burlington County couple who raised $400,000 last fall to get him off the streets. Chris Fallon, attorney for Johnny Bobbitt, appears in court in Mount Holly. Earlier this month, D'Amico told a reporter that $200,000 remained, and that it was in the couple's savings account. This week, D'Amico told NBC Today host Megyn Kelly that more than $150,000 was left. Ernest E. Badway, attorney for Mark D’Amico and Kate McClure, avoids talking with reporters. The couple were inspired to help the homeless man after he gave McClure his last $20 to help her get out of jam. Bobbitt, who at the time was living under an I-95 ramp in Kensington, came to her aid after she ran out of gas nearby and had no cash or credit card on her.